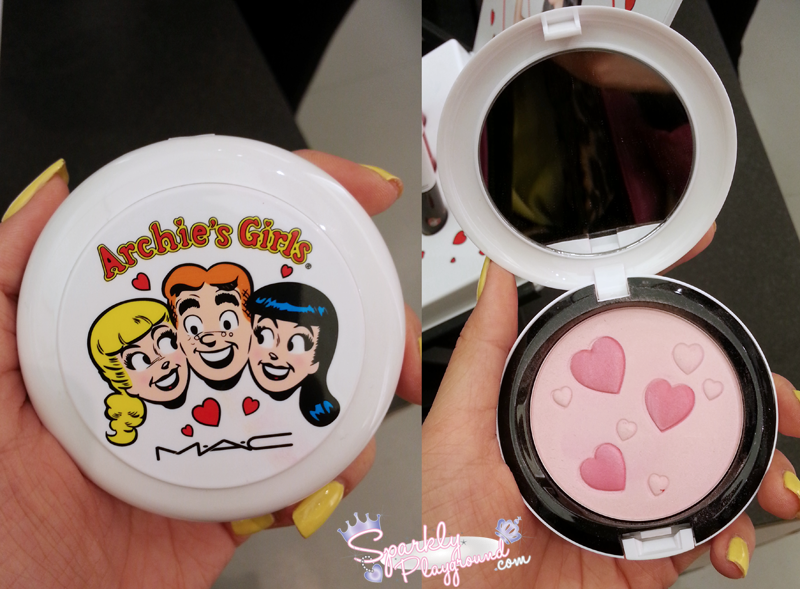 The past Tuesday (February 5), Michele and I went to Scarborough Town Centre to attend the MAC Archie's Girl Party. It wasn't exclusive or anything (beauty bloggers, no worries, you didn't miss an invite LOL). 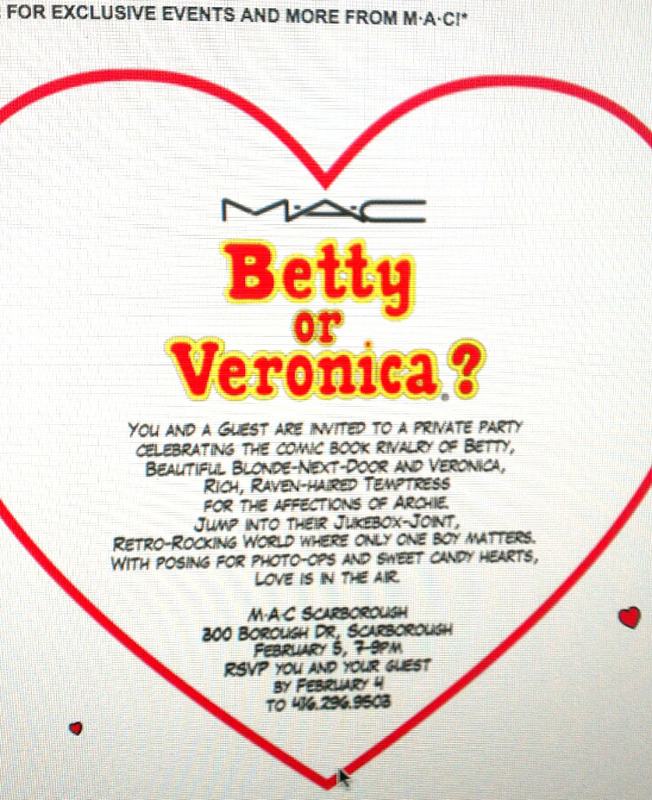 This is the invite email Michele got in their mass emails I believe. Anyways, Michele called for me because I'm not good with these things, and we were booked for 7:30pm. We were also told that's going to be a professional photographer! I'm kinda excited, I was pretty excited for this collection :) We were hyped and stuff and wanted to dress up as Betty and Veronica too! We started to hunt for leaked pictures and everything so we kinda knew what we wanted! Turns out, we both decided to drop the dressing up part.. I forgot what reason. And, obviously the confused me didn't know really get the message and I dressed up. It was kinda embarrassing to walk around STC, wearing 4.5 inch heels in a leather skirt (I was dressed as Veronica) when everyone else is in just tights, jeans and sweatpants. When I got there, there was a HUGE line up. I was kinda like.. what's going on. I hate lining up in malls because it makes me look like a desperate freak with "I wanna blow all my money" printed on my forehead. It's just so silly... unless I'm getting a REALLY amazing deal. So #FML, we had to line up for the longest time ever, way past 7:30pm. I was so hungry and my heels were starting to bother me. Thank goodness Michele was there so it was still hanging out =) ps, this is when "Archie" started coming up for pictures. The "professional photographer" turned out to be a MAC make up artist with an iPhone taking pictures with the special app. No clue where the picture will end up going, I decided I didn't want to take pictures with their phone. Here's my picture with Archie! From far away, I thought Archie's hair was actually strawberry blonde, but it was sprayed on. This model was super nice and easy going! I think I said like 10 times that I thought he was such a tall model! hahah! He's like 6'3 in my eyes. I was in high heels and he's at least a head taller than me! After another 20 minutes, we finally got in! This was placed on top of their MAC Cleansing Oils and Waters. I totally won't mind this in my room. One of the 2 stations that they had to display the products. Some girl took the nail polish to swatch.. damn her! 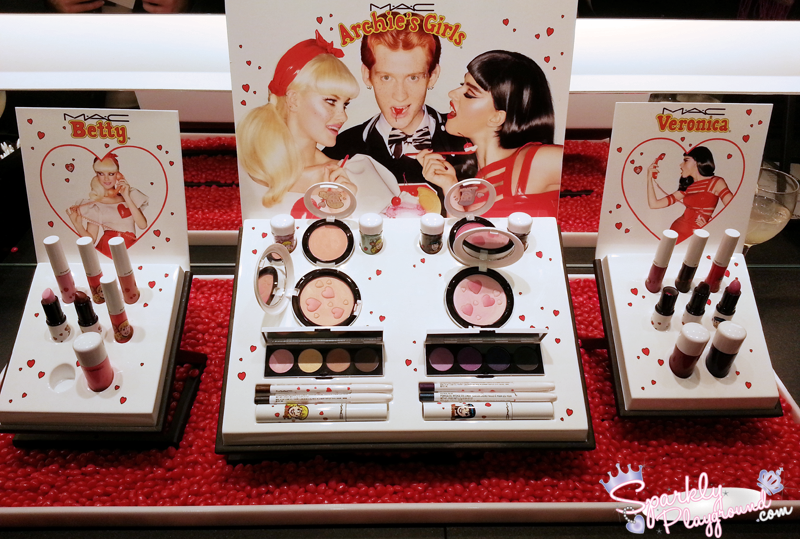 I love taking pictures of displays, I swear it's the beauty junkie in me acting up again! Is it just me or don't they remind you of the Physician's Formula Blush?!?! Sorry MAC, this doesn't excite me anymore. A few years too late. We were given a piece of paper to write down the items we want to purchase. The staff there will pack your items and do your check out. We were given some food and drinks as well - thank goodness, I was so tired from the lining up. The store was also JAM PACKED.. we were all in winter jackets. Sorry, I'm being whiney again. After MAC, Michele and I hopped over to Sephora next door. This girl, does not get sick of Sephora or something. And she almost killed my foot when were there. Over-exaggeration but I swear I felt glass hit me!! She basically tried to shake some product (liquid eyeshadow? ), but the lid wasn't tightly screwed on. It fell on the floor and it SPLATTERED!! I didn't even know how to react. I just like stood there, didn't really GASP in case Michele wanted to secretly walk away... LOL Michele basically starred at her hands for a few seconds then was like OMG x 5 times. hahahhahah. At least Michele walks over and tells the staff there. I'll share with you my haul later this week.